Del 2 al 6 de juliol es farà a la seu de l'ICFO al Parc Tecnològic de la Mediterrània (Av. Carl Friedrich Gauss 3, 08860 Castelldefels, Barcelona) la "ICFO Frontiers of Light Summer School on Emerging Photovoltaics". Per poder-hi assistir us heu d'inscriure aquí abans del 16 de maig. Emerging solar cell technologies will play a key role in energy generation, and advanced technologies such as electrical vehicles, zero emission buildings, wearables or a new generation of smart devices. Harnessing energy from the sun is a rather complex interdisciplinary challenge that has been based on advances made both in material and photonic sciences. This course will introduce the fundamentals of photovoltaic energy conversion both from an electronic as well as photonic point of view and will emphasize on the interplay of photonics with recombination and loss mechanisms, within the framework of the device physics for emerging photovoltaic cells. Recent advances in specific emerging PV technologies will be presented as case studies, in particular perovskite, organic and quantum dot solar cells. The school includes advanced lectures, lab tours, research seminars, group discussion sessions covering cutting-edge topics in research and industry, and is ideally designed for master-level and first year PhD students. Eli Yablonovitch (University of California Berkeley) – Photonics of photovoltaics. Jenny Nelson (Imperial College London) – Understanding loss mechanisms in organic solar cells. Maria Antonietta Loi (University of Groningen) – Quantum Dot solar cells. Gregory Kozyreff (Free University of Bruxelles) – Classical electromagnetism for ultra-thin solar cells. 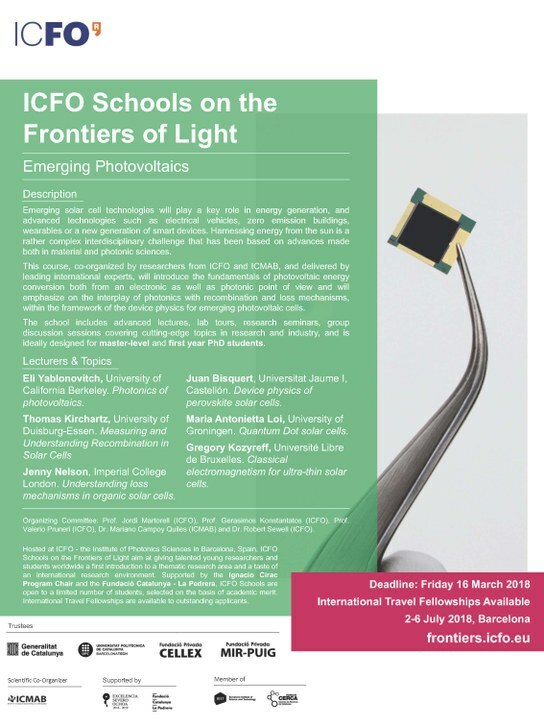 ICFO Schools on the Frontiers of Light aim at giving talented young researchers masters students worldwide a first introduction to a thematic research area and their first taste of an international research environment. These schools incorporate a dynamic and social learning environment beyond participating in lectures, including group discussions, direct interactions with the lecturers, student talks, poster presentations, and visits to labs. ICFO Schools are open to a limited number of students, selected on the basis of academic merit. International Travel Fellowships are available to outstanding applicants from around the world to attend ICFO Schools.